Attracting birds to your garden is a rewarding pastime. Once you have purchased those large sacks of seed you will want to find a convenient way to store the seed. There are a number of considerations to keep in mind when deciding how to store your seed, such as dampness, pests, and access. This is a guide about storing bird seed. 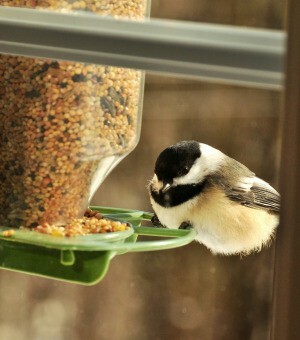 All year long, we feed the wild birds outside, we buy our wild bird seed and black sunflower seed in 25 lb. and 50 lb. bags. We keep our bird seed in a large Rubbermaid trash can with wheels, outside, at the end of our deck. We pour the birdseed alternating each until our container is close to full. Also, inside the "barrel" as we call it, we keep one of those big tins decorated in holiday designs (that hold 3 varieties of popped popcorn, empty of course!) that we use to carry the birdseed to the feeders, as well as a cup to scoop the seed with, for filling the feeders. This is more frugal for us, than just keeping a 25 lb. bag of seed somewhere and having to re-buy every week or so. Our "barrel" of seed, lasts a long time. Hope this can help others out there. I have just discovered how easy it is to fill my outdoor bird feeder by pouring it out of a large plastic 2 liter soft drink bottle. I had a friend save me one and when I bought my bird seed this time, I used the top of a smaller plastic drink bottle, cut off to use as a funnel, and poured the birdseed into the large bottle. I have now collected enough large plastic bottles to put the whole bag of birdseed in. Now there is no mess and the birdseed is kept fresh. Remember our bird friends by remembering this tip for thistle. When thistle seed (also called niger) gets wet, it cakes together and the birds can't get it out of the feeder. To prevent this from happening, shake up the remaining seed in feeders before filling them. Several times a year, you'll also want to clean your tube feeders. Remove the remaining thistle seed, make sure the ports are open and let them air dry before refilling with fresh seed. It's important to store all birdseed in dry, well-sealed containers. Metal garbage cans, for example, will keep the seed dry and protect it from hungry critters. We store bird seed in our garage in a plastic garbage can with a lid. This keeps squirrels and rodents out. You can put the bag itself in there with a scoop or empty the bag of bird seed into the container and keep a scoop with it. I reuse plastic milk jugs with the end cut off to use as scoops for birdseed. I reuse plastic juice bottles to store the seed in.